Everyone gets a midseason slump at some point, the slugger will hit a dry spell, a middle aged man will realize viagra could be useful, or the pro cyclist will run out of somebody elses blood. It happens to everyone. 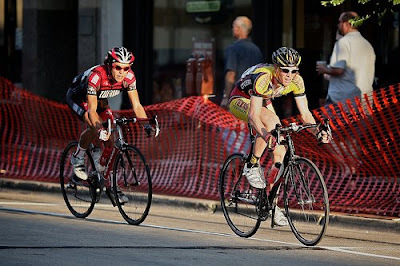 My slump was a loss of mental focus, after the Fitchburg NRC Stage race, the Louisville NRC crit, six superweek races, and a the downtown Chicago Crit, I was fried. Then I got sick and missed Elk Grove. It would be a lie to say that I did not rejoice at the idea that I would not have to drive through Chicago for the fourth weekend in a row. Let me give my personal theory to why I got burnt out. In these hard races (mostly just fitchburg), it gets to be very demoralizing to put all of your emotional, mental, and physical effort into simply staying with the pack and then getting dropped at the end of the race, and then to do that several days in a row…not fun. So after a week completely off the bike, and a weekend without racing, I feel re-directed. Went for a solid ride yesterday and discovered a sad fact ‘mia forma è formaggio‘, a fact also realized by il pirata at one point. Your form for cycling is not a static thing, and to expect excellent form throughout the season is to ask a lot from your body. 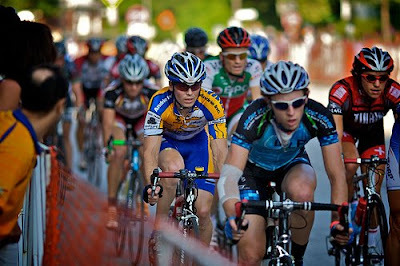 -Pro, or wanabe pro cyclists are a whole bunch of high and mighty douches. Ok, not all of them, just a select few that ruin the general image of the pro-cyclists. Most of their hissy fits result from an amateur touching his brakes too much, or invading their personal space (they may have some touching issues). I got off lucky, only getting called a ‘nervous prick’ once by a Hardly Racing Davison rider and F–king idot several times by one of the boys at DLP. One unlucky amateur locked up his wheel in front of a certain sunny Kelly Benefits rider and was yelled at and called f–king retarded for a full half lap. -The guys at Rock Racing are pretty mellow and cool, but don’t try to follow their lead out when their going to the front of a peleton, they make some pretty nuts moves. 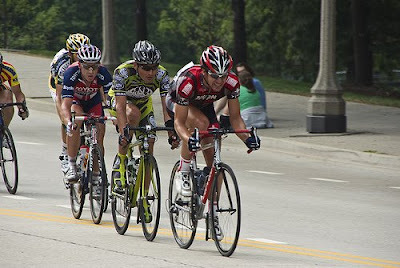 -Spectators with beer are the best spectators: read Downers Ave.
-I discovered the secret to sprinting in crits: positioning, the actual sprinting part doesn’t really matter all that much. -The Colombian Olympic track team is nuts fast, but every day wore arm warmers in 90 degree heat? Fact: Columbia is not that hot. Possibly the arm warmers were covering the bruises from an abusive coach, (Colombian going to the hospital: ‘no really I fell down the stairs’). notice the old school turin kits.